You’ll often hear your health care provider talk about eating foods that are high in antioxidants, one of many reasons a colourful diet is beneficial for good health. Why does this really even matter? Let us explain. We are going to break down the concept of antioxidants and show you how oxidation works in the body, to help you understand just how essential a diet rich are antioxidants really is. Think about the way metal rusts; or how an apple turns brown after it has been cut. These are signs of degeneration, visual cues of oxidation, which are helpful for understanding what can happen internally when something is left unchecked. It is important to note that oxidation is a natural process that happens in the body every day as a basic part of metabolism, but certain things can accelerate it – like smoking, drinking alcohol, pollution, stress, and eating processed foods rich in the wrong fats and refined carbohydrates. All of these factors create a great risk for inflammation and disease. Oxidation starts at the molecular level. For a molecule to be stable, it has to have an even number of electrons. When molecules lose an electron, they become a free radical. This can happen when they are exposed to prooxidants, which are reactive oxygen or nitrogen derived molecules that are natural by-products of energy production, but they can also come from the harmful factors mentioned earlier. Since electrons like to stick together in pairs, these free radicals with an uneven number of electrons go on the hunt for another electron – causing a dangerous chain reaction that turns other molecules into free radicals. Free radicals damage cells, proteins, lipids, and DNA, which in turn, damage different tissues throughout the body. With its amazing capabilities and resilience, the body has a system in place to deal with free radicals. This is where antioxidants come into play. Our bodies can produce some antioxidants as part of normal metabolic processes and others we can get from whole foods. Endogenous antioxidants (those produced within the body) can be in the form of nutrients or enzymes, with enzymes requiring the right vitamins and minerals to do their job. Problems arise when the free radicals outnumber the body’s ability to combat them, this imbalance is called oxidative stress. Oxidative stress is linked to inflammation, accelerating aging process, cancer, dementia, and a wide variety of other chronic diseases. This is why eating a diet rich in antioxidants is an important part of disease prevention. Remember how we mentioned that free radicals have an uneven number of electrons, nut molecules prefer to have pairs? Well, some types of antioxidants can step in to give those molecules one of their extra electrons, to neutralize the free radical and put a halt to the damaging cascade, which they can do without becoming a free radical themselves. 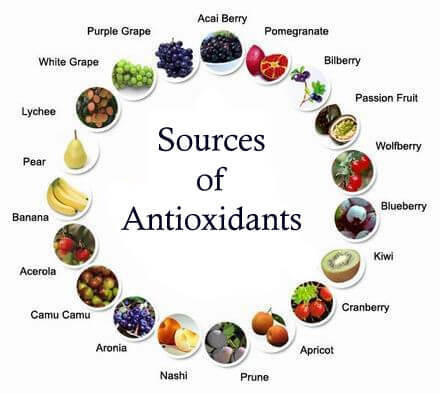 Other antioxidants, those that act enzymatically, can break down and remove free radicals. There are so many different types of nutrients that act as antioxidants and support those beneficial enzymes, like vitamins A, C, E, selenium, copper, and zinc. Eating nutrient-dense foods helps to fight oxidative stress by giving those protective enzymes he right fuel and supporting the body’s natural ability to recycle antioxidants. This is a perfect example of food as medicine – through colourful, nourishing, wholesome foods, we are able to feed our bodies with the right nutrients to fight disease and stay strong. Newer PostWhat has been linked to 95% of all illnesses?